Vital to Middle Eastern Cuisine, preserved lemons are easy to make at home. You can make them with just three ingredients. Lemons don’t grow easily in zone 3, so I’m stuck with store bought. Even when lemons are in season they are really awful here. By the time they arrive at the market they are bruised, desiccated, and often moldy already. Very often I’ve purchased a bag of organic lemons at over $2 per lb. and had them start to mold within 12 hours of getting them home. Normally out of a bag of 10 lemons I actually get to eat only 3 to 5 and the other 5 succumb to mold and spoilage. It’s disheartening because of how good for you lemons are, and how expensive they are. People like Angi Schneider of SchneiderPeeps are so blessed to have lemon trees in their backyard. Angi’s way of preserving lemons is a little different than what I do. 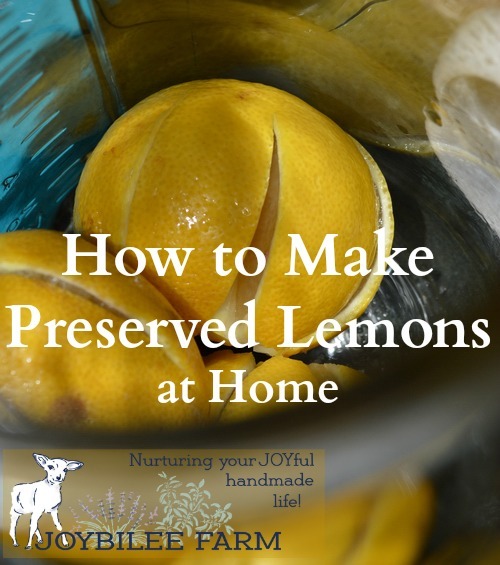 But regardless, if you have a lemon tree make many jars of preserved lemons. If you are like me and have to buy your lemons in the store, do yourself a favour and make at least one jar of preserved lemons, so you can savour the lemony goodness just a little bit longer this year. This recipe for preserved lemons is one of my personal solutions to the terrible state of lemons in Canada. If I make it as soon as I get the lemons home from the market it works. If I wait even overnight, I’m not so successful. The mold contamination happens during shipping and storage and it’s difficult to keep lemons from spoilage once you bring them home. Because of the prevalent mold issues with lemons I remove the lemons from their plastic net bags as soon as I get them home. I spritz each lemon with Thieves Vinegar and wipe it with an un-paper towel to dry it before I put them in the fridge or make preserved lemons from them. Preserved lemons are lacto-fermented in salt and lemon juice. They offer an intense lemony flavour and mild tartness to sauces, dressings, and Middle Eastern cuisine. I’ve had them served as a pickle. I’ve roasted them inside and outside a chicken for a savory, lemony chicken. You can blend them and add them to salad dressings and sauces for intense lemon flavour. Or you can just enjoy looking at the bright colours inside the jars, beside the sauerkraut and kosher dills in your fridge. 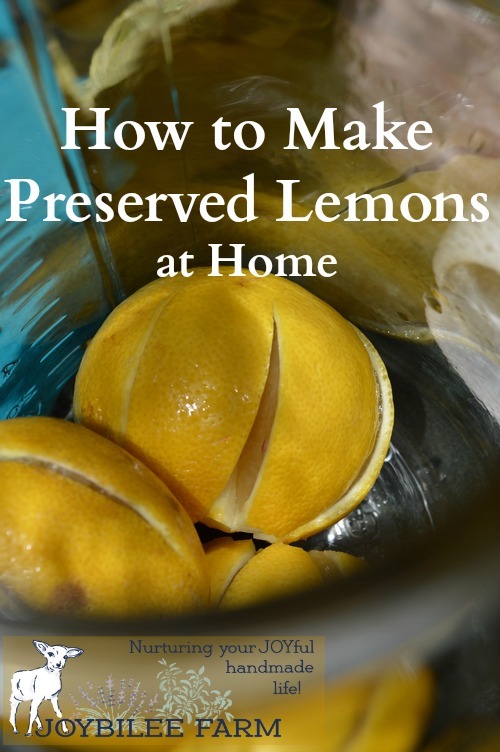 It takes only a few minutes to make a jar of preserved lemons. You’ll enjoy them year round. A plastic or glass “weight” that fits the shoulder of the jar, I used a yoghurt lids that I cut to fit. Wash each lemon and remove the stem and blossom ends. Cut the first lemon in quarters or sixths without cutting all the way through the lemon. The lemon will open like a flower. Sprinkle 1 tsp. of salt inside the lemon, close up the “petals” and place it into the jar. Continue cutting each lemon in the same way and sprinkle each lemon with 1 tsp of salt. Place each lemon in turn into the jar, until the jar is full to the shoulders. Add your plastic or glass weight to the jar, over top of the lemons. 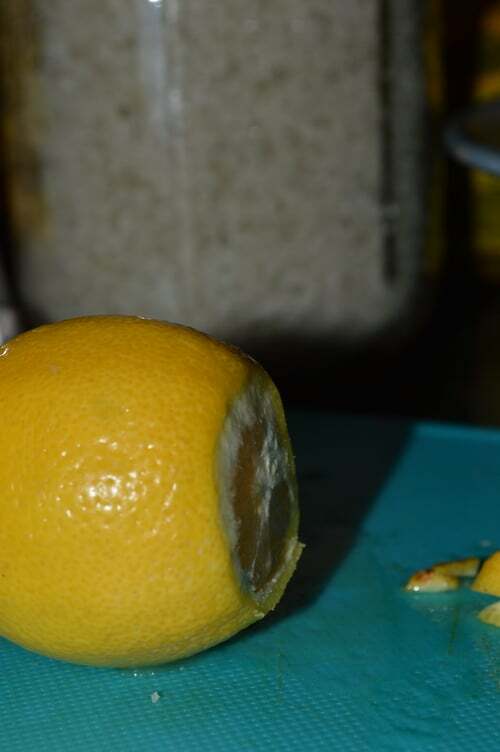 Using a kraut pounder or similar tool, press down on the weight to release the lemon juice from the lemons. Place a lid on jar. 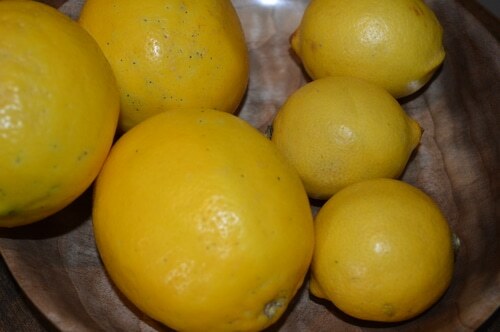 Allow the lemons to sit for 4 to 6 hours while the juices are extracted from the lemons by the salt. Remove the lid after 4 to 6 hours. Press down on the weight to get the juice to rise above the weight in the jar. If necessary add filtered water or freshly pressed lemon juice to the jar to top up the liquid and bring it above the weight in the jar. If you have pickle juice from a successful fermented batch of pickles or sauerkraut add this to the brine to inoculate your batch. Replace lid. Allow to sit at room temperature for 4 to 8 days. After 24 to 48 hours the jar will start to bubble. Once or twice a day push the lemons down under the weight, keeping brine over the weight. The jar will bubble for 6 to 8 days and then the activity in the jar will slow down. 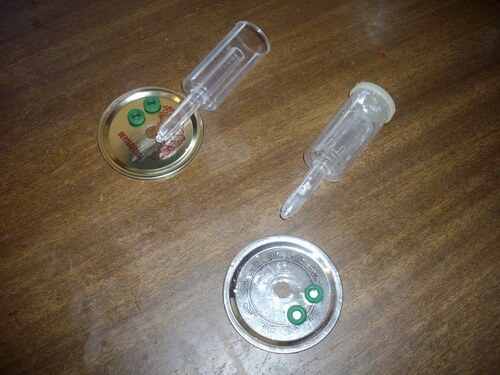 Once the active bubbling stops, remove the two part fermentation lock and replace it with a normal jar lid. Refrigerate the preserved lemons. Keep them for at least a month before you start to use them. The tartness will become milder and the lemon flavour will intensify as the lemons are preserved through lacto fermentation. Use them to add flavour to salad dressings or sauces. The brine is intensely lemon flavoured as well as the lemons themselves. Chop a preserved lemon and add it, along with a sprig of rosemary and 4 garlic cloves, to the inside of a whole chicken before you roast it. 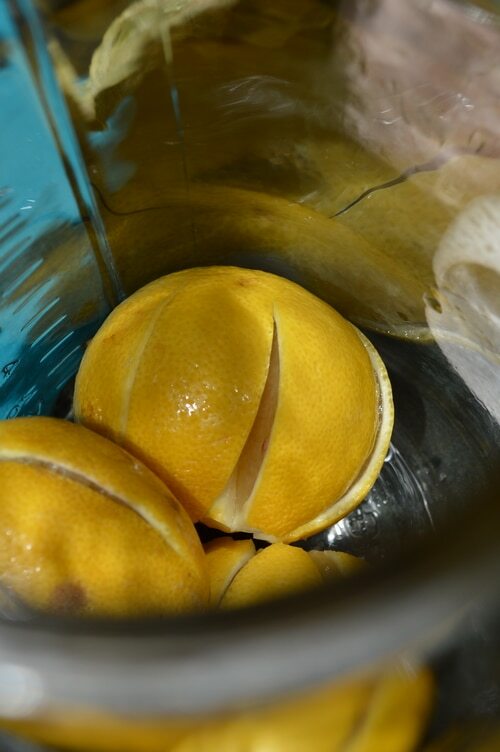 In a blender or food processor add a preserved lemon, 3 tbsp. sesame oil, 1 tsp soy sauce, 2 garlic cloves and a 1 inch piece of ginger and puree. Mix with 1 tsp of honey and use as a glaze for meat, fish, or poultry. Serve them in wedges as pickles. Use the juice of a successful batch of preserved lemons to inoculate your next batch of fermented vegetables. And, could I use frozen lemons for this? Or frozen limes? Thank you! No, once the fruit is frozen there is a breakdown of the cellulose structure in the fruit and the lemons will not maintain their structure. It is better to use fresh, raw lemons and save your frozen lemons for another recipe. So, can I use a glass jar with a pressure lock for most of these stages? Yes, if you have a fermentation jar with a pressure lock, by all means use that instead of my recommendation. My method is for those without specialized fermentation equipment.